Paul Goodman once reviewed Kerouac’s On the Road by listing the actions of the narrative and asking after each one whether it was worth writing about. You could do the same kind of myopic analysis of The Dharma Bums. Two guys climb a mountain together. Then one of them goes to Japan to enter a monastery of the Zen order and we never hear from him again. Then the other guy goes to live on top of a mountain. He spends a few months there, watching the way the weather looks from 10,000 feet up. Then the book ends. There is no “plot,” no “character development,” no “climax,” no “resolution.” Obviously the author is a stupid sort of fellow who doesn’t know anything about novel writing. Send him back to English 202a to learn about the elements of construction. Actually, Kerouac doesn’t write about mountains in order to use them as props for a pre-cooked “story”; he writes about mountains for the same reason he (and Mallory) climbed them: because they are there. The mountain isn’t being used to illustrate something, or as a kind of stage setting: the mountain is the subject: “How did this immense sonumbitch ever get here?” one of his protagonists asks the other, and he is answered: “It probably was left by the retreating glacier …. Either that or this rock tumbled here from inconceivable prehistoric mountains we don’t understand, or maybe it just landed here when the friggin mountain range itself burst out of the ground in the Jurassic upheaval. This is the beginning and the end of the world right here.” That’s a big enough subject for anybody, and it doesn’t need “story,” “suspense,” “narrative” and all that antiquated icing to make it worth chewing on. Kerouac’s critics are, in a sense, right: he is no novelist. He is something a lot more important. His generation has already produced several good novelists and one great one (Norman Mailer); Kerouac is a great ollave. (An ollave, in ancient Ireland, was the highest type of poet, skilled in magic, divination and the casting of spells. Whitman and Rimbaud and Joyce were ollaves.) 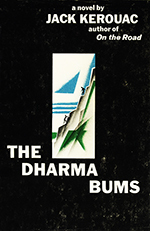 The Dharma Bums is not a story, but a testament. It’s an open secret that the characters and events are not fictitious: “Japhy Ryder,” Kerouac’s hero, is the mystic anarchist poet, Gary Snyder. He goes to Japan in the middle of the book because Gary did go to Japan, and if the reader wants him to come back in the last pages, he will not come back, because Gary didn’t come back until after Kerouac had finished the book. Kerouac would no more invent a conventional reunion for his protagonists than he would add or subtract 1000 feet from the height of Mount Desolation. The Mountain is real, the events are real, and Kerouac’s purpose is too serious (too religious, actually) to allow him to tamper with the Real. More than half the sentences of the book deal not with his characters but with the mountains and clouds and rocks and grass and flowers. “This is what I have seen and touched,” Kerouac is always implicitly telling us, “and now, look! through my magic as an ollave, you see it and touch it, too!” He takes you up to the tops of mountains and lets you see a snowstorm in the making; he pulls you down to the ground and makes you look at a woodchuck: he shows you two young men (himself and a friend) striving to become One with the mountain and the woodchuck. If you are looking for a story to fill your hours with gimmicks and surprises, go elsewhere (TV will even save you the trouble of turning pages), but if you are looking for a poetic (i.e., simple; i.e., holy) truth about the universe, then read Kerouac, read him slowly, and re-read him carefully. If the word “God” means anything, every great poem is a partial revelation of the nature of God; and Kerouac has here written a great poem. 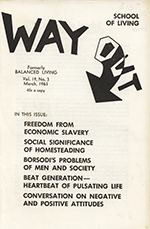 reviewed by Robert Anton Wilson appeared in Way Out, Volume 19, Issue 3 in March 1963.